Environmentally Hazardous Labels. Marine Pollutant Labels. Buy Online! Environmentally Hazardous labels: the Environmentally Hazardous Substance Mark is used to notify shipping personnel that the material being transported is toxic to the marine environment and its ecosystems. Marine Pollutants, or Environmentally Hazardous Substances, are materials that pose a risk to the aquatic environment and its ecosystems, such as marine mammals, fish, crustaceans and algae. ‘Marine Pollutant’ is a supplementary classification requirement that applies only to transport by sea. The actual term ‘Marine Pollutant’ is used in the International Maritime Dangerous Goods code (IMDG), whereas ADR (road transport) and IATA (air transport) dangerous goods regulations use the term ‘Environmentally Hazardous Substance’ (EHS). Anyone who intends to ship hazardous material by road, rail, sea or air, must determine the hazard class of the material, assign a proper shipping name, and determine whether it is an environmentally hazardous substance for the aquatic environment – a Marine Pollutant. This is a self-classification requirement under all transport modes. A substance from any dangerous goods class may be considered a marine pollutant if it is listed in the IMDG Code Index or if it meets the criteria in IMDG of being harmful to the marine environment. The International Maritime Dangerous Goods Code (IMDG Code) establishes regulations for the transportation of marine pollutants and environmentally hazardous substances (aquatic environment). Marine pollutants are noted with a P in both the index and in Column 4 of the Dangerous Goods List of the IMDG Code. If a package or combination package contains a marine pollutant in quantities less than five litres or five kg, it is not regulated under IMDG. ADR regulations refer to shipments by road and does not regulate marine pollutants, however they regulate aquatic pollutants as ‘environmentally hazardous substances’. In ADR, substances are classified as ‘Environmentally Hazardous Substances (aquatic environment)’ if they satisfy the criteria for Acute 1, Chronic 1 or Chronic 2, according to the Table 2.2.9.1.10.3.1. If a package or combination package contains a marine pollutant in quantities less than five litres or five kg, it is not regulated under ADR. IATA regulations refer to air shipments only so it does not regulate marine pollutants, however the Env Haz labels are required for UN Numbers UN3077 and UN3082, unless they contain less than or equal to 5 L or 5 kg per inner or single package. IATA recognize that certain countries classify some materials as dangerous goods, or they may be in a transport chain involving water. Therefore, IATA permits the classification of marine pollutants as environmentally hazardous substances when shipped to/from a country that regulates these materials, or if it is in a transport chain involving water. If a package containing a marine pollutant is to travel by sea at any time during transport, you must comply with the more stringent IMO regulations and label and mark as such. IMDG states that all marine pollutants must be identified with the Environmentally Hazardous Substance Mark, unless the package contains less than, or equal to, 5 L or 5 kg per inner or single package. If a marine pollutant also meets any of the hazard classes – 1-8, it should be assigned to the appropriate hazard class and labelled as such. If no other hazard class applies, or proper shipping name is accurate, the Class 9 (miscellaneous) hazard class applies and the UN-numbers UN 3077 or UN 3082 must be assigned. UN 3077 ENVIRONMENTALLY HAZARDOUS SUBSTANCE, SOLID, N.O.S. UN 3082 ENVIRONMENTALLY HAZARDOUS SUBSTANCE, LIQUID, N.O.S. 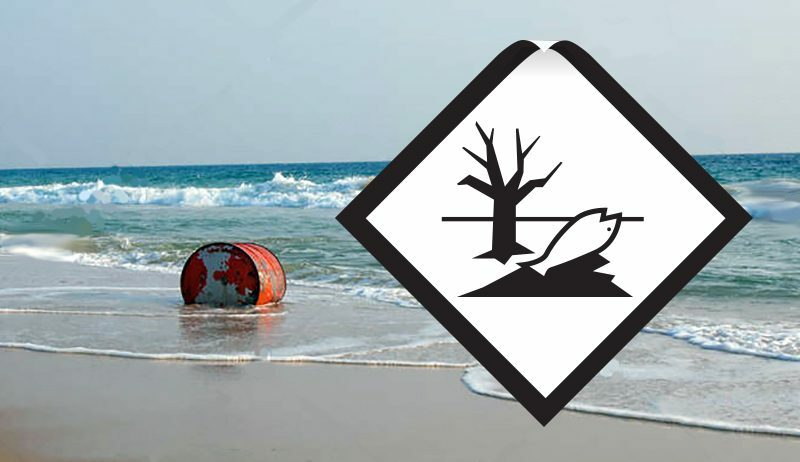 Marine pollutants must be labelled and marked as per the relevant dangerous goods regulations and the specifications for Environmentally Hazardous Labels are defined in the IMDG, ADR and IATA DGR. The Environmentally Hazardous Substance Mark became mandatory on 1st January, 2009. It is required for combination packages where the inner package or single package is larger than 5 L (1.32 gal.) for liquids or 5 kg (11 lbs.) for solids. All modal regulations state that the EHS package labels must be in the form of a square set at an angle of 45° (diamond shaped). 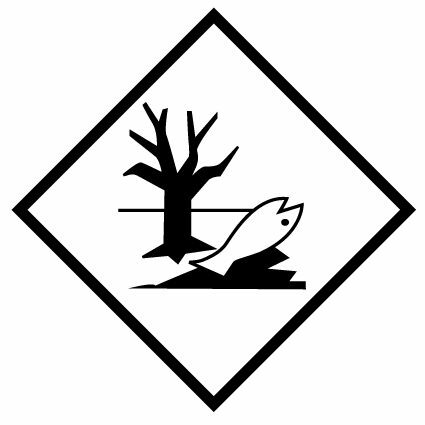 The symbol (dead tree and fish) must be in black on white, or suitable contrasting background. The minimum label dimensions must be 100mmx100mm and the border line forming the diamond shall be no less than 2mm wide. The EHS placard is exactly the same as the package label/mark but must be a minimum size of 250mmx250mm and the outer black border line must be at least 5mm thick. Shipping containers and cargo transport units containing marine pollutants must be marked on all four sides with the EHS Mark, even if the packages inside meet the exception size that does not require individual packages to be marked. The Environmentally Hazardous Substance Mark is required for UN3077, UN3082, and environmentally hazardous substances meeting the classification criteria of Part 2.9.3 of the IMDG Code.